I got a little lazy yesterday after finding out I wouldn't be at work today (or, likely, tomorrow-thanks Sandy). I have a terrible case of cabin fever, and you'd think I'd be used to it after dealing with winter storms consistently throughout my childhood. Weirdly enough, I think living through four floods in Iowa since 1993 has made me oddly calm about everything going on right now, and I feel more annoyed at being shut in than anything else. Mostly I've been watching FAR too much TV & eating pretty much everything in my kitchen. I've made kale chips (twice), pasta, apple cinnamon pancakes for breakfast...next on my list? 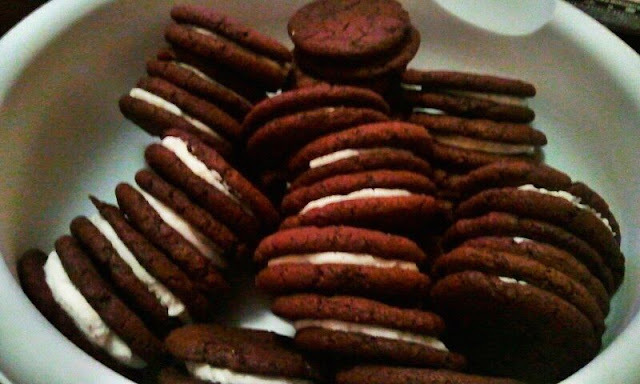 A favorite of mine-homemade oreos. I stumbled across the recipe when reading a blog earlier this summer & traced it to Smitten Kitchen, a fantastic site for everything delicious. Since we still have power, I'm about to go take advantage of it & whip these up...they're super easy and immensely popular with my roomies & friends. Let’s talk about the sugar for a minute, shall we? 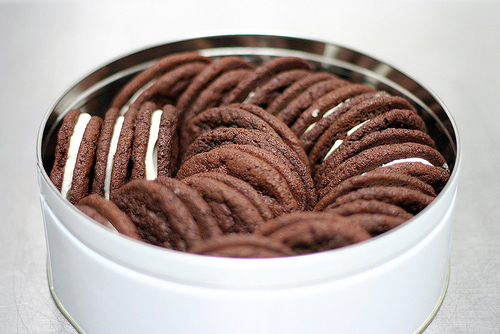 This is a sweet cookie. A good, sweet cookie. 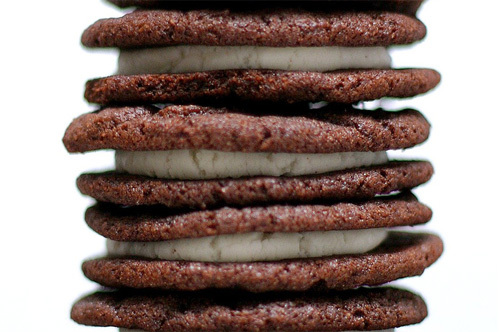 Yet, if you think of an actual Oreos, the wafers are fairly un-sweet and actually on the slightly salty side, which contrasts with the super-sweetness of the filling bringing harmony, happiness, yada yada. If you want your cookie closer to that original, you can take out a full half-cup of the sugar. If you want to make the cookie by itself (as I did a while back for ice cream sandwiches), go ahead and use the full amount. The above photo is from an earlier batch of mine...they didn't last long! I need a yummy dessert for this storm since I already finished all my ice cream. I hope everyone on the East Coast is holding up alright! Thoughts are with all of you.